Record sound from sound card, microphone, line-in device etc. 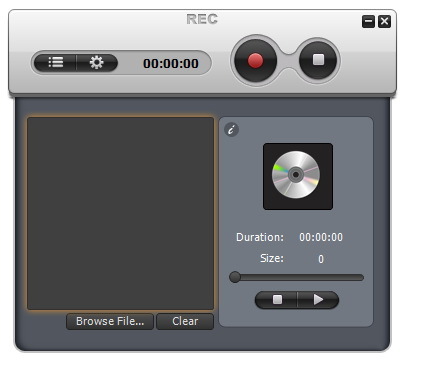 Auvisoft MP3 Recorder records sound from any source like sound card, microphone, line-in device (such as Tape/LP) etc. You can use Auvisoft MP3 Recorder to grab any sound including music, dialogs from movies, game sounds etc from your computer. Captured sounds can be real-time saved in MP3, OGG or WAV format on the fly. Records sound from any source like sound card, microphone, line-in device etc. Auvisoft Video Converter is an easy-to-use software to convert video files between many formats with ease. Converts audio formats AAC, ADPCM, Dolby Digital AC-3, GSM, MP3, OGG, VOX, WAV, WMA from one to another. Records sound from any source like sound card, microphone, line-in device (such as Tape/LP) etc. Split audio file into small pieces and merge audio files in one large file.